Notes: The T-Mobile Tap is a stylish touch-screen phone available in two fashionable finishes, berry and midnight blue, and is ideal for those wanting an attractive and affordable phone. Featuring a compact design, the phone lets customers enjoy fast Web browsing with T-Mobile web2goSM over T-Mobile’s 3G network, a 2 megapixel camera with video capture and playback, music player, GPS for use with location based services powered by TeleNav, and stereo Bluetooth® as well as support for personal e-mail, SMS, MMS and IM. 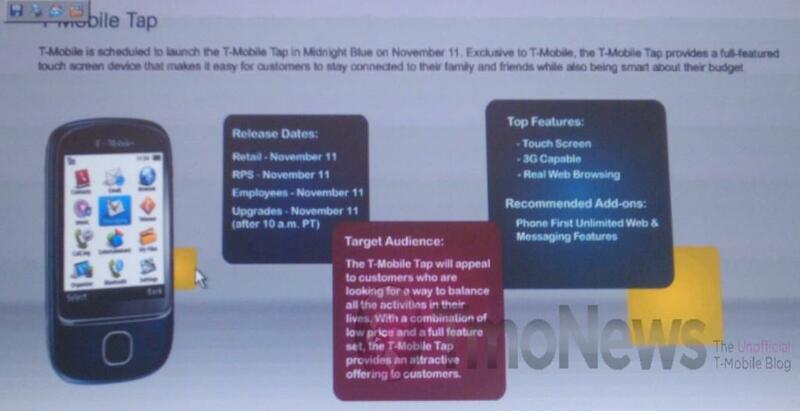 It is anticipated that the T-Mobile Tap will be available by the holidays. Hey I had this POS phone!